A public-private partnership is set on changing life in the rural and township environs in SA. The partnership says it recognises the potential for emerging enterprises to contribute towards job creation and the mainstream economy. With government backing and the belief that SMMEs are the solution to the country’s unemployment woes, the three-year partnership between Sumitomo Rubber SA’s iconic brand, Dunlop, and Ithala Development Finance Corporation’s Small Business Growth Enterprise division will see a minimum of 25 containerised tyre fitment centres being established across KwaZulu-Natal and 100 jobs created. “Sumitomo has been driving this initiative since 2013 and currently has over 100 Dunlop containers across our country’s nine provinces. We are proud to be the only tyre company in SA to partner with rural and township areas to grow communities,” said Yvette Govender, Director: Marketing & Business Development at Sumitomo Rubber SA. 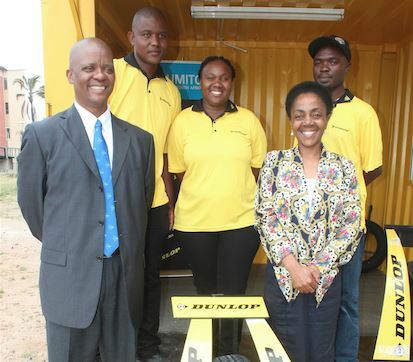 The project will see informal tyre trading containers in townships and rural areas transformed into Dunlop-branded containers, providing opportunities for unemployed youth, women and aspiring business owners to be trained and mentored in tyre sales and repair. Technical tyre training and business mentorship are provided jointly by Sumitomo and Ithala. The latter has allocated funding totalling R4.1 million over the three-year partnership agreement for the supply, branding and fitment of containers. To date, the partnership has resulted in five container businesses being awarded in Estcourt, Ladysmith, Madadeni, Esikhaleni and Eshowe. The Dunlop Container Tyre Fitment Centre programme forms part of the KZN Revitalisation of Township and Rural Economies policy framework spearheaded by the Department of Economic Development, Tourism and Environmental Affairs and is closely aligned with Ithala’s mandate to develop township and rural economies. “For far too long, micro-entrepreneurs trading in marginalised communities have been yearning to participate in the mainstream economy,” said Themba Mathe, Acting Group Chief Executive at Ithala. “As a development finance institution, we remain steadfast in our commitment to championing development in poor and marginalised communities and investing in people to enable an improved quality of life and improved prosperity. He said the partnership was all-encompassing in that it promoted proper skills transfer and training, access to finance and importantly, ensured the profitability and sustainability of enterprises. According to the Global Entrepreneurship Monitor (GEM) report 2016/2017, efficiency-based economies including South Africa should be opportunity versus necessity driven. The report found that almost three-quarters of South African entrepreneurs were opportunity-driven; a statistic that is higher than the average for other efficiency-driven economies as well as substantially higher than the average for the Africa region.